The tough economy begs for many of us to turn over a new leaf and find affordable or free things to do for the not-too-far-in-the-distance New England fall foliage travel season. With that in mind, here are 50 fun, affordable New England fall travel ideas that can be done on a tank of gas, starting from Boston, Mass. 1. Take a mini-train ride into the apple orchards at Belkin Family Lookout Farm in Natick, Mass. What a nice “apple” twist on picking your own apples! This sprawling, historic farm (one of the oldest in the country) also features children’s live entertainment and face painting, farm animals, a farm maze, and, for the adults, the Lookout Taproom with its own craft ciders and food pairings. 2. Visit the West Priory (58 Priory Hill Rd., 802-824-5409), high atop a hill in beautiful Weston, Vt., to join the community of Benedictine monks in the celebrations of common prayer each day, as well as Sunday Mass. The foliage views are spectacular in the fall, probably best around Columbus Day Weekend and the location is truly idyllic. 3. Enjoy some delicious pumpkin pancakes at the rustic Parkers’ Maple Barn in Mason, N.H.
4. 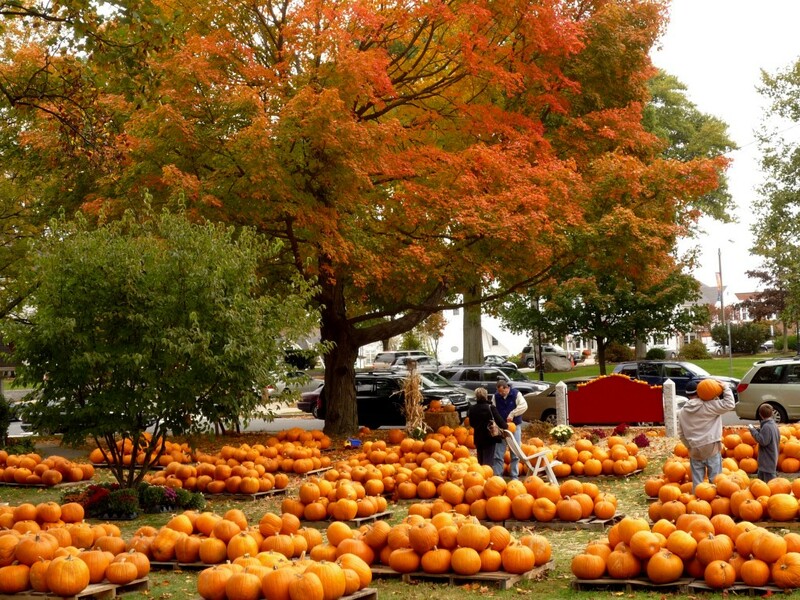 Drive scenic Route 169 in the “Quiet Corner of Connecticut” for some traditionally excellent foliage the third and fourth week of October. It’s a beautiful New England stretch of road from Woodstock to Canterbury with around 200 pre-1855 homes along with farms, historic churches and classic Connecticut small towns with town commons. The gentle rolling hills further enhance this scenic byway that ranks with the best of New England. bucolic drives in New England. 5. Enjoy The Big E, the largest state fair in New England. Located in West Springfield, Mass., the 2018 fair runs Sept. 14- Sept. 30 and features a Mardi Gras parade, midway rides, animal and agricultural exhibitions and musical entertainment. The Avenue of States is a sight to behold — with replicas of New England state capitol buildings you can visit while experiencing local food, crafts and activities. Be sure to feast on a Big E Cream Puff, too, a flaky shell with a ton of butterfat heavy cream! 6. Enjoy a self-guided cider mill tour and fresh cup of apple cider at the Cold Hollow Cider Mill in Waterbury, Vt.
7. Visit Jane and Paul’s Farm in Norfolk, Mass., for hayrides to the pumpkin patch and apple orchards. They also have a fairly challenging corn maze. I would call ahead at (508) 528-0812 for updates on what attractions are in full operation, as the owners are in semi-retirement. 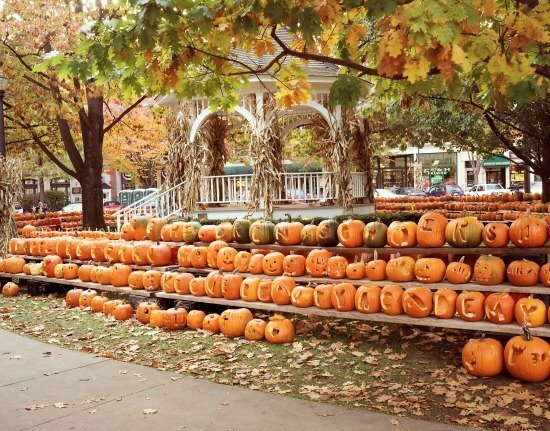 event, formerly located in Keene, N.H., traditionally features a tower of pumpkins and thousands of pumpkins at street level, road race, parade, pumpkin bowling, entertainment, a food and craft court, and a pumpkin dump (clean-up). Log onto https://www.facebook.com/pg/NHPumpkinFestival/about/?ref=page_internal for more information. 9. Pick some apples at Gould Hill Farm at 656 Gould Hill Rd in Contoocook, N.H. (Tel. 603-746-3811) and enjoy incredible hill and mountain views. On a clear weather day, you can see as far as the White Mountains! Check out http://www.gouldhillfarm.com/ for more information. 10. Feast on a pumpkin mousse roll and enjoy weekend fall activities (including apple picking while its lasts) at Phantom Farms in Cumberland, R.I.
11. While in Cumberland, R.I., try some caramel apple ice cream at the Ice Cream Machine. What a great fall flavor! 12. On Sept.29, In East Burke Vt. Village, the Burke Fall Festival will take place. Highlights include a parade starting at 10 a.m., rubber duck race, musical entertainment, horse drawn wagon rides, cow plop bingo (been there, dung that! ), a craft show and beer and wine tent. Beautiful area, way up north — hope you get to visit! Log onto http://www.burkevermont.com/fall-foliage-festival.php for more info. downtown Walpole, Mass. Here, you’ll find hundreds of pumpkins for sale that saturate the church grounds. The pumpkins are consigned from a Navajo reservation in Famington, N.M., and helps more than 1,000 Native Americans employed for this project in New Mexico. For more information, please contact the church at office.epiphany@Verizon.net. 14. Take a drive to the Quabbin Reservoir in north central Massachusetts — 39 square miles and 181 miles of shoreline of a nature’s paradise. The fall colors can be spectacular and it’s just a wonderful place to commune with nature. If you’re lucky, you might even spot a bald eagle! To learn about designated access and hiking opportunities, I’d recommend logging onto http://www.mass.gov/dcr/parks/central/quabbin.htm. 15. Great Maine Apple Day Great Maine Apple Day 2018 takes place Sun., Oct. 14, 2018, 12 noon-4 p.m., at the Common Ground Education Center in Unity, Maine. Watch cider pressing, attend workshops and talks, see and taste heirloom Maine apples, make apple art, walk through the Maine Heritage Orchard, or enter a pie in the apple pie contest. 16. Take a refreshing 45-minute walk around Walden Pond in Concord, Mass. As many of you know, this was the home to famous author Henry David Thoreau, and is, today, filled with scenic splendor. 17. Don’t forget that the New England coast has foliage, too! I highly suggest visiting Camden, Maine — without a doubt one of the most picture-perfect coastal towns in New England. The 800-ft. Mt. Battie lends incredible views of the coast, especially nice during the fall foliage season. I’d give it a try around the third week in October for peak foliage, but call the Penobscot Bay Regional Chamber of Commerce at 1-800-223-5459 for the latest updates. 18. Take a scenic motorcycle ride in central Massachusetts and northeast Connecticut, and enjoy the hills and valleys and quaint small towns. 19. Take an easy hike up Mt. Sugarloaf in South Deerfield, Mass., for some wonderful foliage views. Call 413-665-2928 to learn when the foliage will reach its peak in 2018. 20. Mt. Monadnock at 116 Poole Rd. in Jaffrey, N.H. (Tel. 603-532-8862), is a bit more challenging that the aforementioned Mt. Sugarloaf, but a much, much easier climb than many other New Hampshire mountains. With an elevation of 3,165 ft., the level of difficulty is moderate to reach the top. Once you are there, however, the panoramic views are really impressive! I would look at the State of New Hampshire’s foliage tracker to find for optimal peak colors in this southwest New Hampshire region. 21. Visit Pleasant View Orchards, a… well… pleasant, roadside farm stand in Smithfield, R.I.
22. Gaze at the amazing fall foliage at idyllic Echo Lake in Franconia State Park, in the White Mountains of New Hampshire. What a nice place for a picnic! 23. Drive up to Mid-Burke Mountain in Northeast Kingdom, Vt., for some very impressive fall foliage views around the Columbus Day Weekend. 24. Enjoy the Topsfield Fair, Sept. 28. to Oct. 8, 2018, in Topsfield, Mass. It’s the oldest agricultural fair in the United States and an excellent one, at that. From the giant pumpkin contests and animal displays to midway rides, this fair is a blast! Log onto http://www.topsfieldfair.org for more info. 25. Linger at picture-perfect Chocorua Lake in Tamworth, N.H.
26. Fall is a great time to shop and what better way to get in the autumn shopping spirit than visiting an authentic country store? 27. 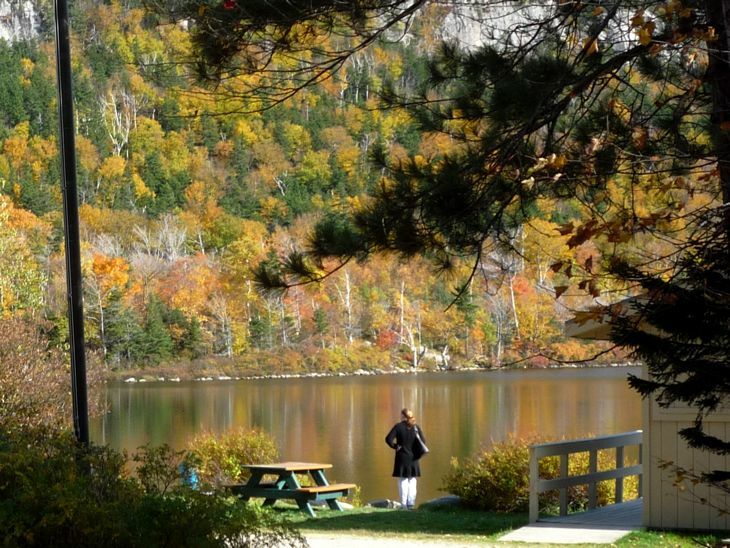 Visit Grafton Notch State Park on the Route 26 Grafton Notch Scenic Byway. The park’s Moose Cave is a boulder cave within a 200-foot long gorge that has 45-foot tall walls. The byway crosses the Appalachian Trail and passes through the 4,000-foot Mahoosuc Mountain Range. For more information — including anticipated peak fall foliage times — call the Bethel Area Chamber of commerce at 800-442-5826. 28. Take a scenic drive along the 34.5 mile Kancamagus Scenic Byway, spanning from Conway to Lincoln in the White Mountains of New Hampshire. Often regarded as one of the best fall foliage driving routes in the United States, the Kancamagus Scenic Byway is like a box set greatest hits collection of colorful forest and mountains views. 29. The 2018 Berlin Fair runs from Sept. 14-16, in Berlin, Conn., and includes pie-eating contests, frog jumping, large animal and crafts exhibits and live entertainment. Log onto http://ctberlinfair.com/ for more information. 30. VisitMaine.com tells us that geocaching in Maine is a great way to make a fall walk in the woods more fun. More than 7,000 caches are available in Maine, according to the Geocaching Maine website, and more than 4,500 caches have been hidden in Maine since 2010. Go to http://www.geocaching.com/seek/ for more information. 31. Savor a pumpkin spice ice cream cone at Walpole Creamery, 532 Main St., in Walpole, N.H. (603) 445-5700). The ice cream here is made daily, and you can taste the difference — very thick and fresher tasting! 32. The Fryeburg Fair in Fryeburg, Maine, is regarded as one of New England’s best, and it takes place in 2018 from Sept. 30-Oct. 7. 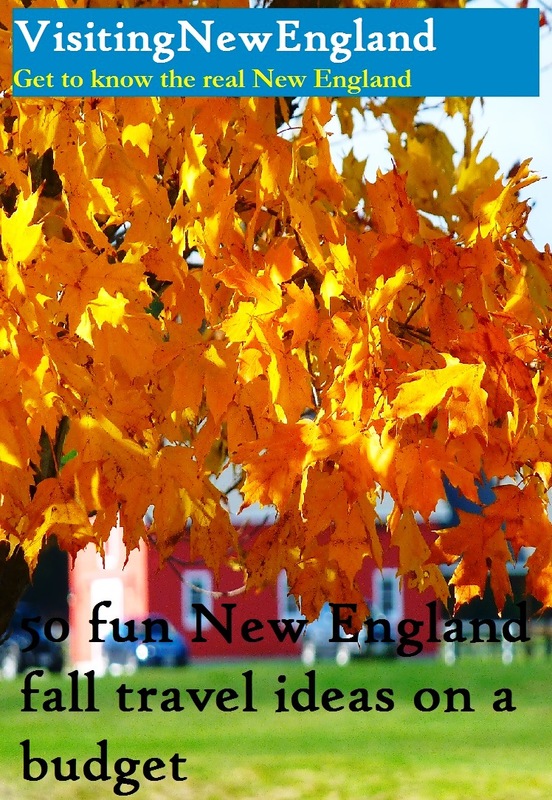 With livestock events, a parade, harness racing, tractor pulls, mechanical rides, a food pavilion and a whole lot more, this is absolutely a classic New England fall event. For more information, log onto http://www.fryeburgfair.org/. 33. Enjoy the apple picking, homemade apple dumplings, country store and weekend events at Brookfield Orchards in North Brookfield, Mass. 34. Munch on a homemade apple cider donut at some local farm stands and a certain famous doughnut shop! 35. Take a road trip to Adams Farm in Cumberland, R.I. where the pumpkin patch, hay rides and beautiful rolling countryside will get you in the fall spirit! 36. Visit Brookdale Fruit Farm, a landmark farm in Hollis, N.H. where the apple picking gets mighty impressive around the third week of September. Here, you’ll also find local eggs and honey, grass fed beef, pies, jams, bread, cheeses, plants, cooking items, gifts and New Hampshire made items. Brookdale also has an ice cream stand featuring Anabelle’s Ice Cream, making what we feel is some of the best ice cream we have tasted in New England. 37. We feature an article on bike riding the Cape Cod Canal Trail in November, but this would also apply to September and October, too. It’s less crowded, there’s a little chill in the air, and the water views are so nice! 38. Take a rail bike excursion along the Belfast and Moosehead Lake Railway in Maine. 39. Ride the bike path in Stowe, Vt., starting in the Village and going about five miles through some scenic forests and meadows and the West Branch River. A nice aspect of the bike path is you can stop whenever you want to check out nearby shops, or perhaps to grab a bite at the many restaurants. 40. Take a fall walk at sunrise along Long Sands Beach in York, Beach, Maine. 41. Speaking of York Beach, we suggest visiting the 34rd Annual York Beach Harvestfest & Kidsfest, Oct. 13, 2018. This fun event features a corn toss challenge, hayrides, live bands, juried crafters, an ox roast, & a lot more. The Kidsfest will include kids games, pony rides, face painting, crafts and special entertainment. Log onto http://yorkharvestfest.com/ for more info. 42. Go to the 2018 Milford Pumpkin Festival in Milford, N.H., Columbus Day Weekend, featuring “some of the largest pumpkins in New Hampshire on display, musicians and entertainers, food, crafts and lots of events for kids.” Log onto http://www.milfordpumpkinfestival.org/ for more information. 43. Take a walk through the largely unknown but so beautiful 150 acre Walpole Town Forest in Walpole, Mass. The foliage gets nice here around Columbus Day Weekend. 44. Visit Acadia National Park in Maine. 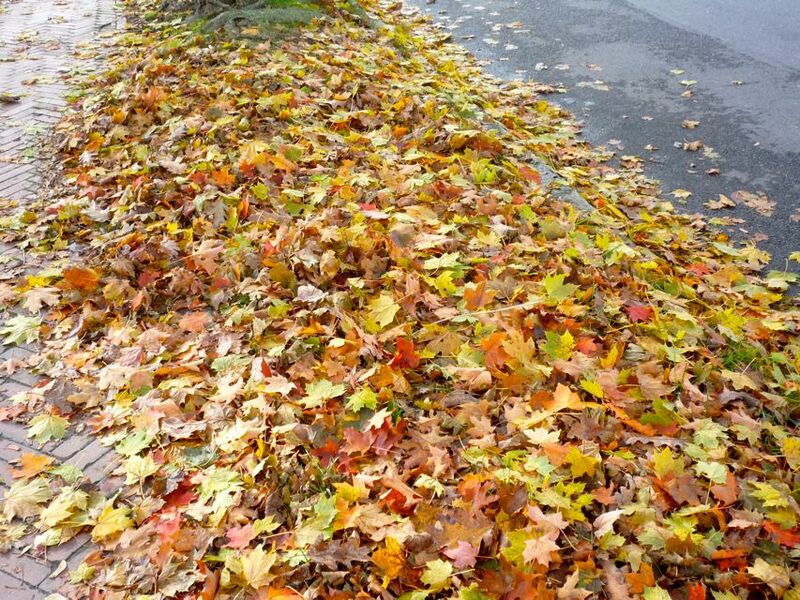 Yes, it’s known as a summer destination, but some tourists prefer the fall. The 27-mile loop road offers not only scenic rocky coast but also views of forested valleys, lakes and mountains, carved by glacial force. Add a little foliage and, and as they say in our 21st century world, “OMG!” I’d recommend checking Maine foliage updates to find out when the best time is to experience peak foliage. Be sure, too, while at Acadia to check out the fall foliage views from Cadillac Mountain. 45. 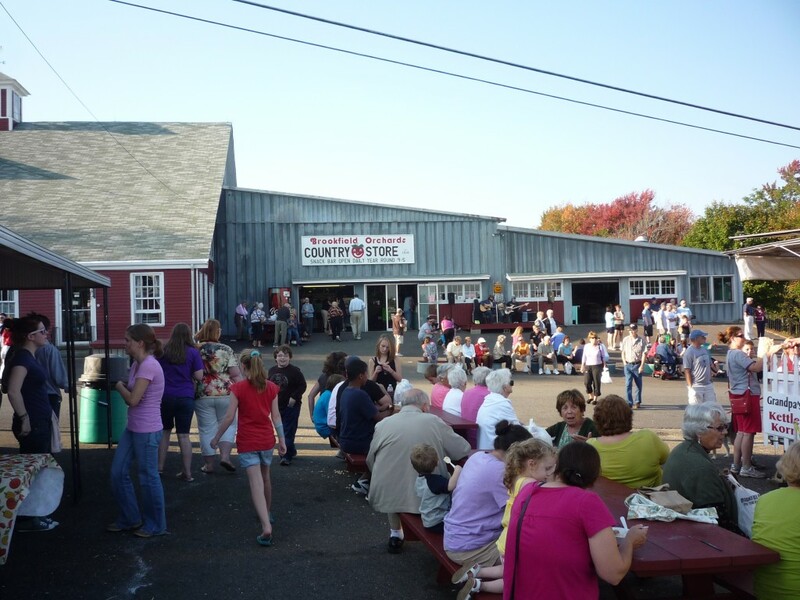 Take the family to the 51st annual Boothbay Railway Village in coastal Boothbay Harbor, Maine. Fall events include a Fall Foliage Festival Oct. 6-8, 9 a.m. – 5 p.m. on Saturday, and 10 a.m. – 4 p.m. on Sunday and Monday. Log onto the Railway Village web site at http://railwayvillage.org/event/48th-annual-fall-foliage-festival/ for more info. 46. Attend the Newburyport Fall Harvest Festival, Oct. 7, 2018, 10 a.m.-5p.m., in Newburyport, Mass. This is a terrific event that in one of New England’s most picture perfect coastal towns features food from local restaurants, arts, crafts and live entertainment. Free admission. 47. Enjoy the fall beauty of Newfound Lake, beautifully situated in the New Hampshire towns of Bridgewater, Bristol, Hebron and Alexandria. With 22 miles of shoreline, this is a wonderful place to hike, kayak or canoe, or just take a scenic drive around the lake. 48. Rustle through the leaves and enjoy the coastal views, big old homes and mom and pop shops in Fairhaven, Mass., just across the harbor from New Bedford. This is one of New England’s most underrated towns! 49. Take in the peaceful aura of Walpole, N.H., during the fall. It is a quintessential, small New England town that features a scenic village green with gazebo, relaxing tree-lined streets, and LA Burdick Chocolate — famous for its handmade chocolates at its chocolate shop. This flagship LA Burdick also has onsite a French-American restaurant, and cafe with baked goods. For the record, LA Burdick is not cheap but order frugally and the result will be well-aligned with our Thrifty New England Traveler theme here! 50. The Berkshire Botanical Garden hosts its 2018 Harvest Festival at 5 West Stockbridge Rd. in Stockbridge, Mass., on Columbus Day Weekend — Saturday and Sunday from 9 a.m.- 5 p.m. Spanning the beautiful the 15-acre Botanical Garden campus, the Harvest Festival features children’s activities, rides, and games, entertainment and more than 100 regional vendors. You will also find a farm market, tag and plant sales, and educational offerings. Proceeds from this event benefit the Garden’s horticulture and education programs. For more information, log onto https://berkshirebotanical.org/events/harvest-festival. If you enjoyed this article, please share the graphic below on Pinterest. Thanks! ← Why You Should Visit Castle Island in South Boston, Mass. Thanks, Peter, glad you enjoyed the list! Yes, Cider Hill is amazing, definitely an “A” list New England fall farm destination. I agree, downtown Amesbury is really nice and has come a long way in the past 20 years. I hear you, Jeff, it’s not a true bargain destination but we have found the value for the money is exceptional for this type of fair — so much to do, and eat! Glenn, could you tell us about the North Adams Fall Foliage Festival and Parade? What do you like about it? Thanks, Teena, great ideas for fall travel. What a tremendous combination — the Kancamagus and Fryeburg Fair! I could also add Sherman Farm Corn Maize, Championships of Mud Football, Return of the Pumpkin People, foliage rides on the Conway Scenic Railroad, ride the Cog (at off-season rates) before it shuts down for the season and the Arts and Crafts Fair are a few more. There is SO much to do in North Conway during any season! Teena, you are a great wealth of information for the North Conway area. Thank you so much to contributing. Our blog door is always open and welcoming for you to do so! Nice list, though if you are coming to northern VT Columbus Day weekend looking for the big leaf show, likely it will past peak by about a week. Excellent point, Ryan, thanks for mentioning it. The colors can vary, though, by season. 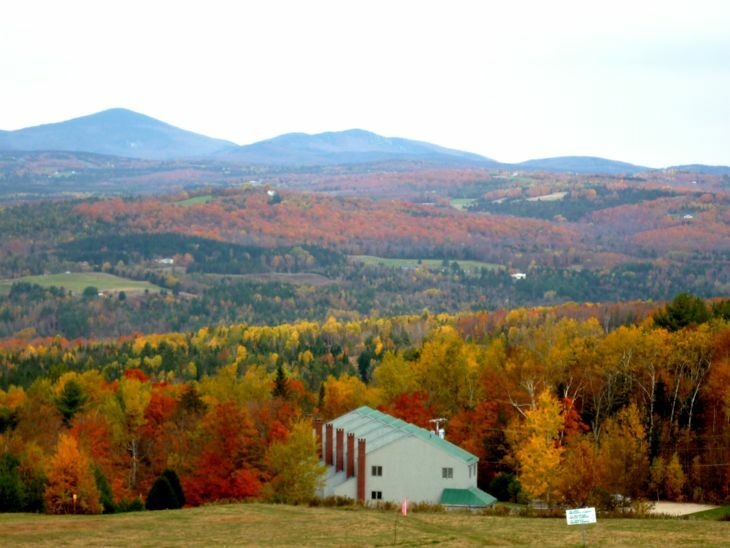 I remember being in northern Vermont for Columbus Day Weekend in 2008 and the colors were pretty good. Perhaps the best thing to do is keep track of the colors through your local meteorologist or online.